We all lead very different lifestyles but the beauty of The Organised Mum Method is that it can be adapted to suit you! It is a flexible routine that is bringing balance to homes all over the world! Lorraine explains how she uses TOMM to keep on top of everything as a busy working mum. How would you describe your working situation? I have a busy job as a Trading Standards Officer – I work 30 hours a week (often much) more but this does give me some flexibility doing full days and shorter days. I’m lucky that my parents help with after school childcare, but this often means I don’t get home until gone 7pm. Tell us about your typical day? Up at 7am – getting me and kids ready for school and work (mornings are often stressful) but since following TOMM, I honestly can say they are a lot less stressful, as it is now in my nature to get everything ready the night before –which actually makes me sleep better! Drop kids at school and head to work – on a day I finish early I would pick the kids up from school and use that time to get things done – this is when I plan in my 30 minutes for TOMM. So for me, some days might mean I do an hour (say I have worked a long day Monday I will do 2 tasks Tuesday as I will finish earlier). I also have Colitis so a full day at work can leave me exhausted in terms of doing a 30-minute task, so for me, it works perfectly having some flexibility to the method and means I am not overwhelmed. Before I started TOMM I was terrible at leaving jobs and going to bed – now (because I know how much better it feels) I get everything ready for the next day and it makes a MASSIVE difference to life. Also, the girls now love joining in, so I feel I am setting them up for life – if one is at a club, the other will help me do the 30 minutes and bizarrely we spend more quality time together even when doing the jobs rather than me running around like a headless chicken! How do you fit TOMM in? We have a wipe board in the kitchen where all the tasks are written down. I allow some flexibility if I know I have a long day at work and also switch different tasks to different days if it will suit better that week – saves me feeling a failure if I don’t get it done on the TOMM planned days !!! So for example, for us, bedroom day is often a Saturday morning – the kids help and I have found that week on week things get done quicker and quicker – I feel like I have a head start now. The girls are on board and love the difference, so it has now become pretty easy to fit it in because it has just become part of our routine. I don’t set a particular time in the day to get it done – just the days – it works for us. 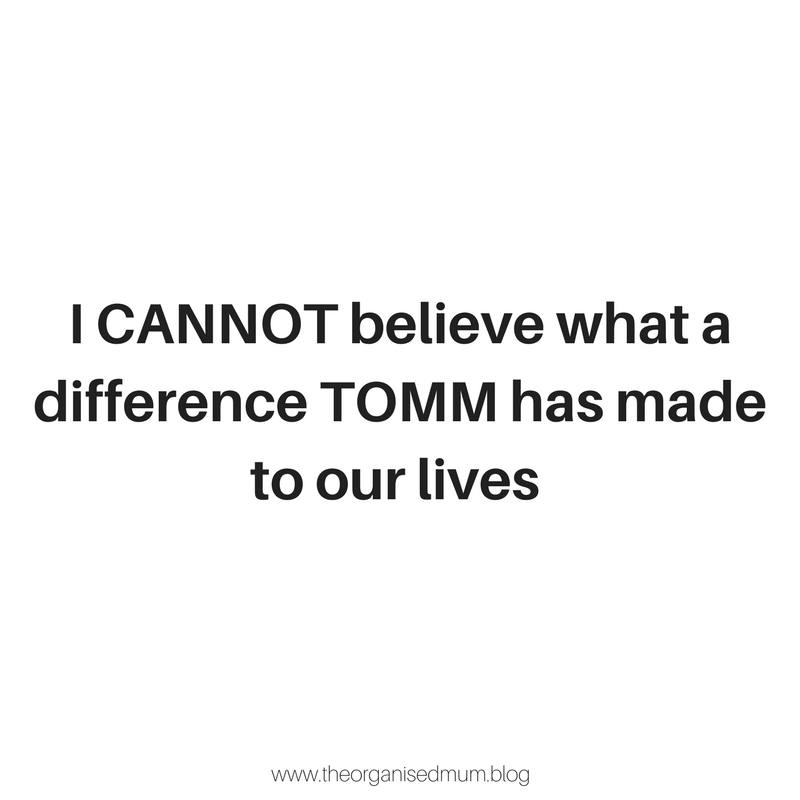 What has been the most challenging thing about finding time for TOMM? I was VERY sceptical it would work for us but within a week things had changed beyond what I thought was possible. The hardest part for me was actually focusing that 30 minutes. Before I spent all my time doing household jobs but getting nowhere! Once I started to properly focus I found that 30 minutes was more than enough if I’m honest. As the weeks have gone by you always have less and less to do because you have kept on top of things. I don’t beat myself up if something gets missed through lack of time – prior to following TOMM, this would have caused chaos because I was behind on everything, now it just means a bit extra the next day, it is so easy to pull it back. I also had to be tough on myself when bootcamping different rooms – it never felt there was enough room in my house (small 3-bed semi) but not anymore – I got rid of so much stuff and have not missed any of it. I also don’t have a dishwasher (!!!!) so it was ALWAYS the thing that got left – no anymore simply because I am on top of everything else. What top tips do you have for others who are new to TOMM? Focus focus focus – I now realise that before I spent a lot of time doing stuff around the house but not actually achieving anything – I always felt overwhelmed and to be honest a bit of a failure – I CANNOT believe what a difference to our lives this has made – I actually have a bit of time for me now which is amazing and when my daughter was poorly for a couple of days last week it meant I didn’t stress about things getting out of hand in the house. My daughters are with me 24/7 and I work basically full time – I don’t have the natural tidy gene trust me, so if it works for me anyone can make it work for them – once you start doing it you won’t go back because a switch flips at how much easier your life is following something so simple yet massively effective. My parents came to babysit on Saturday night – normally this would be a full afternoon of panic cleaning – literally ten minutes pop round this time and I was done – complete game changer! I was the person who dreaded anyone coming to my house without prior notice – not now! A sense of calm is now installed at my home – I’ve never, ever had that before and I LOVE IT. Next Post I’ve Got The Key, I’ve Got The Secret!